Design criteria for The Fish Farm required it to be modular (same design, repeated), lockable, transportable, affordable and profitable. 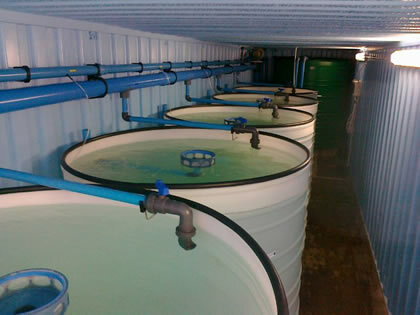 The profoundly simple solution was to fit retired 6m and 12m shipping containers with a series of tanks, pumps and filters thereby turning the containers into micro-intensive fish farms. Water consumption is minimal, because it’s like a swimming pool – the water circulates through filters and back into the tanks, and if necessary, expelled high-nutrient water goes onto a vegetable garden or through a vegetable aquaponics system. In fact, every veggie garden needs a Fish Farm! Put the clean tap or borehole water into the tanks, and let the fish fertilise the water before it goes to the veggies! With The Fish Farm the urban dweller can access the means of production, earn income, learn new skills and make a difference environmentally. Designed to be operated by a family, a co-operative or one or two people on a part-time basis, it is profitable, affordable, repeatable, transportable, lockable and stackable. Whilst reducing pressure on our marine environment through low-carbon-footprint protein production, The Fish Farm creates wealth and empowers poor urban and rural communities, delivers job creation and food security, and contributes to sustainable cities.